Social Media is the most important source to drive traffic to your blog. In order to drive more readers to and from your social media channels, share your posts and content regularly on your social feeds and also in your communities. Once your readers visit your site, you need to hook them to your site and to your social media channels, encourage them to share your stuff and to regularly drive them back to your site. You might need some smart tools to help you with these tasks. If you provide give-aways on your site, like downloadable checklists or whitepapers, you can collect your visitor's email address, or you can make them pay with a social media action, like a share, follow or like to get more engagement and endorsement for your content. Make it easy for them to follow your social media profiles to get them hooked on your social streams. Placing social media follow buttons on your site will help you generate the number of followers on your social profiles. Social media plugins for follow buttons help you to encourage your website visitors to follow your social media accounts. Creates a simple button bar for your site. You can choose the size of icons, choose to open link in a current or new tab. Also, you can have the social media follow buttons automatically added to the bottom of all post or/and pages, and can position the link buttons using either a widget, a shortcode or a template action hook. Next, you need social media share buttons on your site. 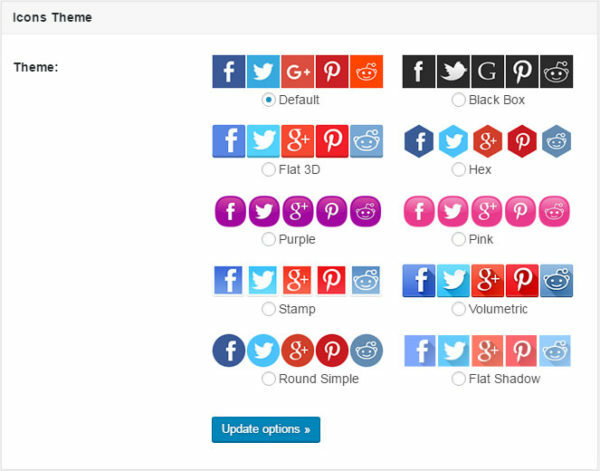 There are practically hundreds of plugins for social share buttons to choose from. Hardly any other function for WordPress offers more choices for plugins than social media share buttons. Another excellent simple free plugin for beautiful buttons for all popular networks such as Facebook, Twitter, Pinterest, Reddit, Pocket, VKontakte. Place them above or below your content, or manually via shortcode. The buttons are responsive and the share counts work without external scripts, so you don't have to worry about page speed. Displays visually stunning sharing buttons in a variety of locations on your blog without slowing down your site. You can add share buttons above/below your posts or via shortcode, floating share bars and share counts. The premium option offers more networks for sharing, hover 'Pin' buttons for Pinterest, Tweet quotes and fully customizable share texts and many more. Premium plugin, included in a SumoMe suite of apps to help you grow your blog traffic. The "Share" plugin can be edited from a clickable interface to customize and add social buttons to any place on your website, from a wide range of social services including Facebook, Twitter, LinkedIn, WhatsApp and more. Some of the general social media sharing button plugins also offer buttons for your images. However, it's worth looking for a plugin to take special care of your images. Twitter is one of the most popular social networks. Click to tweet plugins make your post easily shareable for your readers. By placing ready-to-share, "tweetable" quotes on your site, you can create micro-content into your blog post that makes your content more shareable and brings extra traffic from Twitter. The tweet will have a link to your page or post. The link to your post will be automatically added to the tweet text. You can define your Twitter handle and choose whether the plugin will use the full page URL or a shortened one. The "via" and URL can be easily removed the URL from the resulting tweets, and links can be turned into nofollow links. Don't wait for other people to share your content. Use every opportunity the social media world provides for sharing and promoting your content yourself. Cross-promoting your post on multiple social networks will help you to drive a consistent stream of traffic to your site. There are many social platforms, special groups, and communities, where you can share your posts. Sharing your content manually every time you publish a new post can become quite tiresome and time-consuming, especially if you publish regularly. 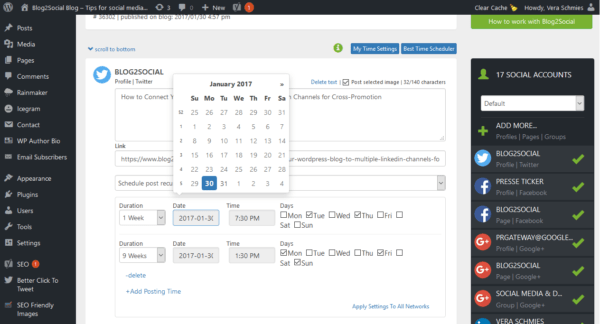 Social media automation plugins can help you to automatically share your post, whenever you publish a new blog post to save time and work. There are multiple choices for tools and plugins for auto-publishing your posts. However, social media automation can boost or bust your valuable work, if done wrong. Don't just shoot and forget. Careless automation can turn your social media accounts into a lifeless robotic content stream. To effectively cross-promote your blog post, don't just cross-post the same message on every social network. Use tools that help you to optimize your social media posts to fit each social media platform and community. The prominent features of the Facebook Auto Publish plugin are highlighted below. Social media follow buttons are important means to turn your website visitors into followers. However, for new visitors, they might feel like buying a "pig in a poke" because they don't know what to expect from your social media updates. Create Social Feeds of any or all your photos and videos from Facebook Pages, Groups, Album Photos, Album Covers or Event from Facebook, Instagram, Twitter, Vine, Pinterest, etc. Add as many social feeds as you need, implement with shortcodes. The premium version provides customizing options for how many posts, pictures, tweets, or videos for each individual social feed!. Create embedded feeds out of RSS feeds and your social media content from Facebook, Twitter, Tumblr, YouTube, Vimeo, Pinterest. It's free, but you need to sign up before you can embed it into your WordPress website. If you are opting for your Facebook Stream only, this plugin could be your choice. The Facebook Social Stream plugin generates a responsive, SEO optimized and cached Facebook feed for your website. Just configure the Facebook page name and add the shortcode to your page. Display YouTube videos as video-box. Promote your Facebook events on your website. Choose from different themes to change the style of your Facebook stream. Social media plugins for social comments allow your visitors to log in with their social media credentials in order to comment on your posts. The comments appear both on your site and on social media streams. This can help to expand the reach of your site and improve overall engagement. Allows shortcode for rating and voting posts via comment custom field with a lot of attributes. Livefyre Comments 3 is another commenting platform that allows your visitors to engage in real-time conversations on your website by collecting social mentions and displaying them on your site. Comments can be filtered by networks or user and can also be easily moderated. Over to you: Did you miss anything on this list? Do you have a favorite social media plugin you would like to share? Don't forget to leave a comment.